See why the Carolinas is the best place to live! Watch Talk of the Town Carolinas (formerly Talk of the Town Fort Mill Tega Cay). It’s a weekly video series about Fort Mill, Tega Cay, Rock Hill, SC and the Carolina’s. The weekly video program highlight events, places, businesses, organizations, and people of our great communities. We invite you to watch and learn more about our community whether you live here or want to move to the Fort Mill and Tega Cay area. It’s a great place to live, work, and play! Look for new episodes on Tuesdays. The Talk of the Town Carolinas program is produced and brought exclusively to you by Realtor Carmen Miller of the Miller Realty Group. We post weekly videos on our YouTube channel, blog, Facebook pages, Twitter and more. To view all Talk of the Town episodes, click on the playlist down arrow at the top left corner of the video window below, or go to our Talk of the Town Video blog page, or?Carmen Miller’s You Tube channel and Fort Mill Tega Cay Homes Facebook Page. Our goal is to show you what it is like to live in Fort Mill and Tega Cay, SC or anywhere in the Carolinas. Several years ago we created homesfortmill.com, ?seetegacay.com and seefortmill.com, websites. The websites feature our area with pictures and frequent blog posts, but we wanted more. 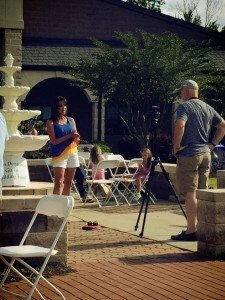 Video short stories seemed like the next best step to show you more about Fort Mill and Tega Cay. So, Talk of the Town Carolinas was born in April 2015. We produce the weekly videos on our own and are grateful to have Patti Mercer as our host and company spokesperson. Like what you see or want us to film your local event? ?contact us. ?Want to be notified when each episode is published? Subscribe to our weekly newsletter. Host Patti Mercer is a Fort Mill native. Patti and Carmen share a passionate mission to promote Fort Mill and Tega Cay and the Carolinas. ?In 2006, Patti was crowned Mrs. South Carolina United States with a mission to promote the importance of early intervention and diagnosis of Autism. In 2008, Patti was crowned Mrs. South Carolina International. Patti stays active in our community and is currently a radio host of Close Up Fort Mill Tega Cay on WRHI radio on Tuesdays and Thursdays at 11:30 am and is the Co-host of WRHI’s Palmetto Mornings every weekday morning.